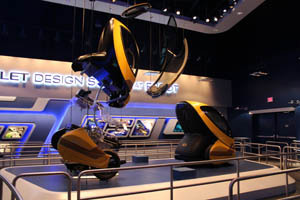 We had the opportunity to ride Epcot’s new Test Track 2.0 (below, left) during the Cast Member preview yesterday! Thanks to Steve Fox for inviting us, we had a great time. 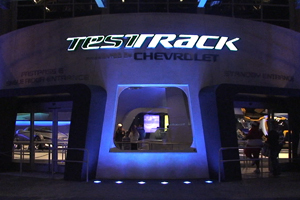 The queue and much of the attraction has been completely redesigned, with a clear Tron-inspired feel to it. A Chevrolet En-V is displayed near the entrance.